So, yesterday i tried out heather's headband pattern - so easy! 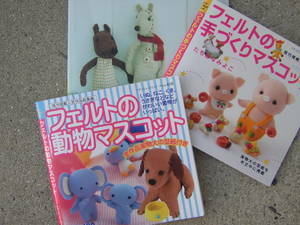 i hated turning them all inside out, but it was worth it - so cute! i made an adult yellow (which is actually a cute seersucker) for my sister, and a child-size for a friend. the blue one is for me! how many is that total?.....7! holy cow! 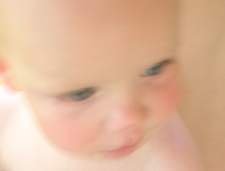 and i know i said that i wasn't going to post pix of my kiddos so much, but this one of monkey is so blurry it doesn't count, right? i love this picture, blurry or not. 1 - double-jogger stroller- i bought this right after thomas (my 2nd) was born. it was a lifesaver! if i would have realized how much better it was to have a jogger, i would have bought a double when i only had one kiddo. seriously, why waste money on a single, and then have to upgrade? and i could have put snacks and toys in the extra side.... also - it's worth the extra money to get an aluminum frame! so much lighter! 2 - rocking chair - bought right after princess (1st). 3 - rocker/recliner - we upgraded after thomas - which was a good thing, because it saved us during his ear-infection phase! when they won't be laid down to sleep because of an ear infection, you can still catch some zz's by just reclining. also - SO comfy! and perfect for nursing. it is known by all as kirsten's (or mom's) chair and is quickly vacated if i want it! 4 - little tikes slide - bought for princess when she was about 16 months. we keep it inside usually, and all my kids use it still! they slide down it, use it for playroom obstacle courses, and of course, push matchbox cars down it. 5 - little tikes picnic table - i usually keep this inside, too. i got sick of cleaning up 'yogurt-paintings' on the big table. this was a great place to have them eat - especially snacks. and we've used our steam-cleaner on it to get it really clean. plus, the kids feel like 'big-kids' when they sit there. and when i had princess' preschool co-op going on, we fit several kids there for coloring and snacks. 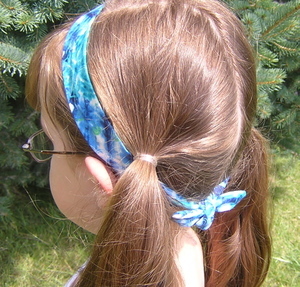 well, i'll post pictures later of the headbands that i finished yesterday - so cute! 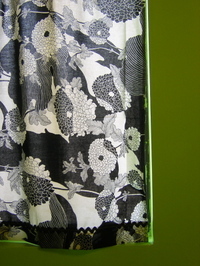 in the meantime, here's a picture of my 'magnet wall' that i did recently. 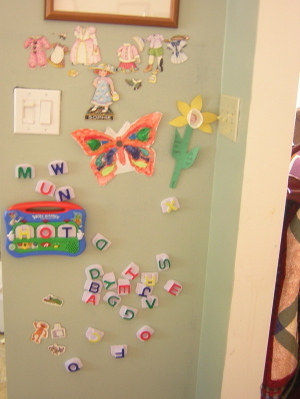 i got tired of having the kids playing with magnets on the fridge while i was in there cooking (and said magnets then ending up under the fridge or stove), so i painted this little wall right around the corner with magnet paint. great idea, right? but, not sure i would recommend it. it took about 4 coats before we could tell it was magnetic at all! 9 coats of magnetic primer total, plus one of our kitchen color! to do it again, i think i'd buy a sheet of metal and screw it on somehow. and our word whammer toy (a little heavy, yes, but REALLY strong magnets) won't stay on without a nail under the hammer to support it! I was an art education major in college. i took classes in everything from printmaking to basketweaving to sculpture. i spent my days (and nights) wearing grubby clothes and making inky messes to meet deadlines. i didn't have a focus - ideally i would have gotten my BFA along with my BA, but i wanted to graduate at the same time as my husband. I miss making stuff! i have had such fun the past few weeks because, inspired by a lot of blogs, i made it a priority to make stuff. 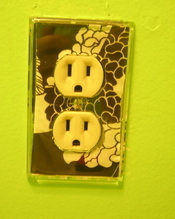 it is such an outlet for me. SO! i will miss it no more. i realize now how much it helps me. so, when the kids go to bed i vow to create! last night my husband and i went on a date - we went to see x-men 3 (entertaining, but not as good as 2, in case you haven't heard). i wore my new 'audrey' shirt, and my favorite jeans that i patched up right before we left. i made a cool patch for the knee out of (the first fabric i saw) some scraps from my latest quilt. and i took my new bag i made last week (to sneak in some hot tomales and H20). i liked the feeling of wearing and holding my own craftiness! my creativity has found outlets in stuff like birthday parties for my kids, creative cakes, fun holiday games and stuff. and i think that that is a valid and completely worthwhile thing to do. but i have a sister who graduated in art ed as well, and a sister-in-law who is working on an MFA in printmaking. neither have kids yet, so i get jealous when i see all the cool stuff they've done. my kids come first - always. and they still will. but, in my limited free time, i'm going to do more. i'm excited about that. more for me, i guess i should say. 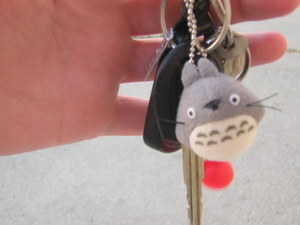 and to qualify for their free shipping bought this little totoro keychain - i didn't know how big it would be - it's tiny! i love it! it makes me happy just to look at it. 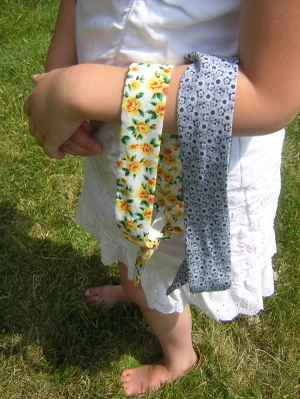 so, today's projects are (besides taking thomas to a preschool end-of-year party and his 'creative movement' class) making 'heather' headbands and some pillowcases. the painting got done, except for around a light fixture that i forgot to have aaron remove. the green is way bright, but i'm liking it! 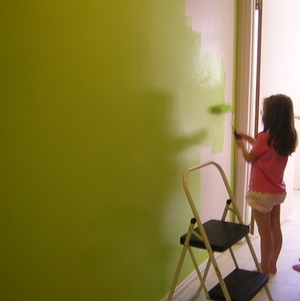 everyone should have one room in their home with really bright color! 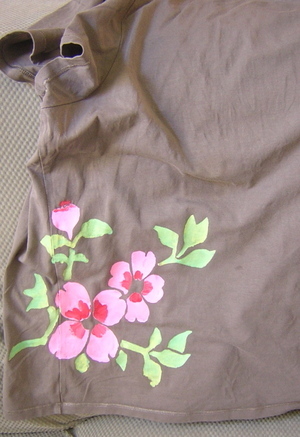 So, my sister and I tried freezer paper stenciling yesterday, and it's just as easy and addictive as everyone says! it was fun to have a fun, fast project. 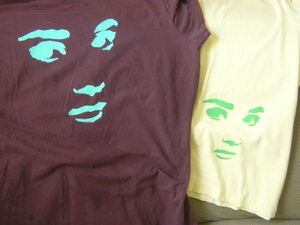 we both used the same stencil (audrey hepburn), except she chose to use a smaller size. don't they look completely different? i swear i did a good job cutting mine out and everything, it looks different because i did mine light on dark, so it looks like a negative. I also did this one - i had fun painting this one - i used a really yellow-y greeen loosely mixed with a tiny bit of light turquoise for the leaves. i like how the stencil crosses over the side seam. can't wait to try some more! I also finished that wall-hanging quilt i showed you yesterday - but i want to wash it to get my quilting marks off before i post it - so later! today, my mom and i are going to start painting the downstairs bathroom and laundry room - can't wait to show off pictures of that - i hope the color turns out how i think it will. Thomas has his last day of preschool today. he qualifies for the special-needs class through the school district. it's essentially just a regular preschool, but there are only about 12 kids in the class, with a 2-1 student-teacher ratio and they have a speech pathologist and occupational therapist to help, too. pretty cool. it's been a really positive experience for him, and i hate that it's over, but we're year-round here, so he only has about a month off before 'next year'. yay! but we'll have to keep him busy - here's something we did for him last week - we got a big plastic box, filled it with rice, small plastic animals, and a funnel. he loves it. 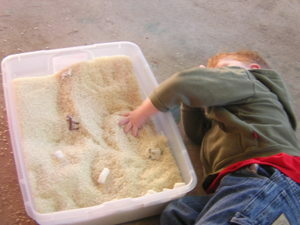 it's supposed to help with tactile sensory stuff, and fine motor, plus it's just fun. he's wearing a sweatshirt and jeans because it was 6:00 AM on saturday, so a little chilly. 6AM on a SATURDAY!!!! oh well. He likes to lay down to play with stuff sometimes when he is really into something - so i guess the rice box is a hit! Why do birds get up so early? seriously - it's not even close to light out - like 4, 4:30 when they start being obnoxiously loud! i think they are what wakes up my 3yo at 5-5:30 every morning this summer... i am so tired! 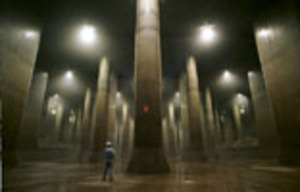 on the other hand, i decided that i do have time to start my blog. since my little guy only wants to watch his train movies first thing in the am, and the other 2 are asleep, this is my time to type. i have 3 kiddos, whom i will call by internet names, and it's completely against my nature not to show off my beautiful kids, but i think i'm going to be cautious about putting up their pix as well. we'll see as we go on, i guess. Thomas: 3yo, train enthusiast, diagnosed with PDD-NOS (on the autism spectrum), not the quiet, play cars autism (usually), the loud, crashing, looks like he has ADHD autism... again, so tired! so i was inspired to blog after finding a lot of cool, crafty blogs - so many people out there that are so creative and fun! i love how everyone shows stuff they're working on. and i had no idea that other people loved mail as much as me! no pattern, just picked some fabrics from my stash that would go with my living room, still, but lighter, summery colors. 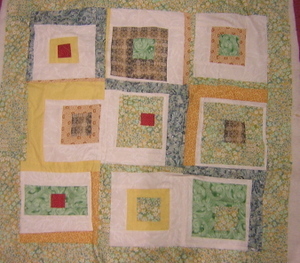 on friday i got all my blocks finished, sewed on the borders, cut the backing and batting, basted it, and started machine-quilting it! i've never got that much done in one sitting before. but i got greedy - i didn't baste well enough and there are already a couple of puckers. oh well, i think when i wash it it'll be less noticeable. 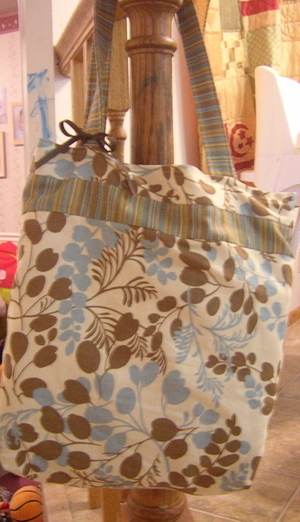 The other thing i made last week was this bag (in one sitting - just a quicky bag). again, no pattern, but i think it turned out cute - it's lined with the stripey-fabric, and the ribbon is a key-fob thing (a martha idea). I guess that's all for now - will be back soon! Today, yard-saleing (sp?) 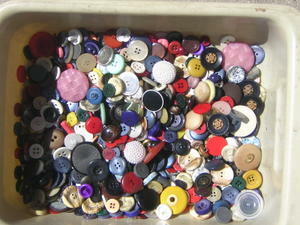 with my mom, I found this big-ol' box of buttons! 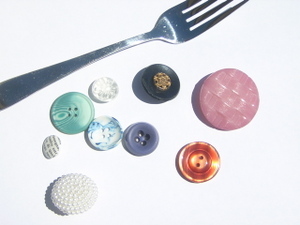 cool, cool, buttons! big, little, covered, metallic...... oh! the lady selling them laughed because i kinda squealed when i saw them. guess how much? $3!!!! that's right. Other good finds today: A box of u-haul wrapping paper (to have the kiddos stamp and use as wrapping paper, or just to paint or draw on), some board games, and a $2 little tikes ride-in truck. but that one goes to a friend of ours.